Here are five tips for avoiding blunders that can make you look like an amateur—and undermine your reputation as an expert. Get it straight from the source’s mouth. Even The New York Times makes mistakes, as revealed in Kill Duck Before Serving, a funny collection of The New York Times corrections by Linda Amster and Dylan Loeb McClain. Go ahead and use newspaper clippings, magazine articles, newsletters and press releases as background information, but also go straight to the source as part of your reporting. Don’t get trapped in a Web of lies. When it comes to research, dot-coms can be dot-bombs. As Tina Kelley once wrote in The New York Times, “On the World Wide Web, straight facts can be hard to find. After ploughing through dense and recalcitrant search engines that offer more sites than you can point a mouse at, after enduring delays, lost links and dead ends and arriving at a site that looks just right, Web surfers must deal with uncertainty: Is the information true, unbiased and free of hidden sales pitches?" Spell it again, Sam. Writers should ask people to spell things out: “Your name is pretty unusual, how do you spell it?” “Which spelling of John do you use?” “How do you spell the name of that stream?” I’ve learned the hard way that a source who replies “uh-huh” after a writer spells his or her name and asks if it’s correct may not be paying attention. Don’t judge a book by its cover (or title). Generally books are not fact-checked and also quickly become outdated. That’s why it’s important to assess the research value of particular books by looking for clues. The first clue is the copyright date of the book and whether the book was published by a reputable house. Find history that repeats itself. 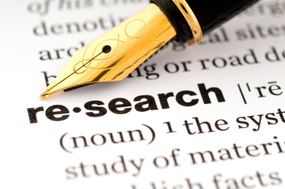 Many writers make the mistake of relying on a single source when researching. Make it your researching creed that “information repeated in two reliable sources is a publishable fact,” words of wisdom passed on to me by book editor.